Enter the world of Tanglewood. A creepy yet whimsical tale of a young boy and his close encounter with an unlikely resident. The first of many short stories to come based in old England. It was the most exciting time of year for all the children since Christmas wasn’t too far away. Our little village was magical and whimsical in the winter. It was decorated to fit right into a page from a storybook. The wreaths filled the lamp posts along every street, the cobblestones were covered with a thin sheen of frost and snowflakes, and the smell of apple pies and cinnamon filled the air. It seemed like the perfect fairytale to live in; however, this fairytale didn’t have a happy ending. 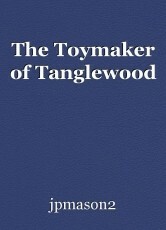 This one happens to be the depressing melancholy life of our strangest citizen: "the Toymaker of Tanglewood"
It was the dawn of the first cold night of the year and I was the first one to ride the sled down Lickey Hill, the highest spot for sledding in all of England, or so we imagined. My lads and I had been waiting for this snow for a fortnight and couldn’t wait to plummet to our thrilling doom into a snowbank filled oak trees like castle towers. We had to take turns since Philip was the only one with a sled, ever since Bruce broke mine last year. Bruce was our portly friend who was fond of cakes so we all just called him “Hobnob. He ended our previous winter with a trip to the infirmary after splitting my sled in half when he hit a tree. He had trouble slowing down, probably because his trousers didn’t fit properly, but he turned out okay in the end. Then there was Charlie, our youngest friend, who we called mouse. The bullies at school liked to call him mouse too, but it was different when they said it. As the evening sun nearly disappeared, we all needed to rush home before any of us were never allowed outside with each other again. My mum was making my favorite bangers and mash tonight and I couldn’t wait to get to the supper table. As I set on my way home, every evening I visited several Shoppes in the village of Bromsgrove. The first was Simons Candies where Mr. Simon always gave me some delicious Cadbury chocolate to take for my mum and dad, but I usually ate most of it before I got home. Bradly the baker sold a loaf of bread and the evening newsprint to me for 30 pence. Dad was fond of reading our local paper after tea, and Joe the butcher, was famous for his pork pies and sausage rolls. The lampposts were being lit as the clock tower struck six. I needed to hurry before mum began to worry. In the rush, I bumped into Mr. Finley our postman. His letter spilled from his bag. “Thanks, Mr. Finley” I shouted as I continued to run home. Suddenly I heard a howling laugh, it echoed through the homes of my village. I turned around and could only see the crippled branches of the trees. In the distance, a dark figure emerged. A shadow larger than a giant. It stood crooked and lanky and at the very top of its blackened head was a long narrow top hat. His arms had stretched to the ground and his fingers looked like long jagged. His eyes were red blazing, burning coals. I was petrified and couldn’t speak. The figure slowly walked towards me and his howling laugh turned into a child-like giggle. With his long branch-like arms, he reached inside of his overcoat and handed me a tattered and burned teddy bear. The figure began to wither away into the night and his laugher continued to echo into the air. “Who was this man and what is this building?” I thought to myself. I scattered to pick up my things and nearly slipped as I took off running once again. I rushed through my front door to find my mother cooking supper and my papa sitting in front of the fireplace, smoking his pipe while reading a book. “Where have you been? Its nearly time for bed”, my mum said with a sincerely worried look on her face. With my fear filled eyes gleaming at hers she gently kissed my forehead. As I reached into my sack, I pulled out the teddy bear to show her and laid it upon the table where I sat. “Where did you get that? “she asked with a slight grin on her face. “A man gave it to me,” I said. “A man? What man?” she asked. The look that my parents gave each other was that if they had been fearful and startled. She grabbed the teddy bear from the table and held it close to her chest. “What did he look like?” she asked. As I explained to her the best description I could remember of the gangly shadow the more her expressions began to grow grim. “was he wearing a top hat?” she asked. I nodded. Her and my dad walked toward the table, slowly sat down and placed their hands over mine.My mother was such a lovely woman, every word that came from her mouth was always comforting. I had never seen her like this before. From outside, the sounds of the wind began to rise, and the crackle of the fireplace faded to a soft whisper. The candle light from the room dimmed as my mother began to tell me words I would remember for the rest of my waking eyes. “What does this have to do with the man?” I asked. “Well, the man who died in the fire, he too wore a top hat.” She said. My heart sank to my stomach. I then realized what it was that I saw. The man with the teddy bear was really a ghost. He was the ghost of Tanglewood. © Copyright 2019 jpmason2. All rights reserved.